Slendatrim Diet Pills Review: Is it Safe? Slendatrim is a diet pill that boldly claims to boost metabolism, help with hunger, and revitalize the consumer's overall level of energy. The product originates from Vitegrity, a family company based out of Florida. Although this product has great advertising, strong reviews on their website, and seemingly originates from a mom and pop company, our team wanted to verify all of this to ensure its legitimacy. However, we were very quickly disappointed when the refund section of the website came back "page unavailable". Needless to say, this raised our eyebrows and we immediately suspected a scam may be underway. Moreover, the consumer is required to enter specific contact details such as email and phone number before they can even see the price of the product they are purchasing! On top of all of this the product claims it is FDA approved on its website, however, the fine print immediately beneath contradicts: "Representations regarding the efficacy and safety of Slendatrim have not been scientifically substantiated or evaluated by the Food and Drug Administration." 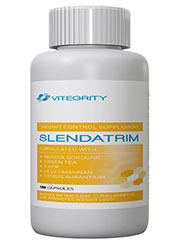 Slendatrim is relatively affordable, and does somewhat effectively block hunger cravings since it has glucomannan. Slendatrim offers plenty of false advertising on its website, has a shifty system of not showing the consumer the price until AFTER they've entered their information, and incorporates some questionable ingredients that have either been proven ineffective or replete with side effects. Moreover, we could not access the money back guarantee page because it was broken on the Slendatrim website. Despite the products rampant false advertising, we were somewhat impressed with the fact that the product contains glucomannan. Plus Slendatrim is packed with vitamins and nutrients. However, we were concerned with a few of the ingredients in Slendatrim, mainly citrus aurantium, which is known to have adverse effects upon the heart and blood pressure. Additionally, Slendatrim contains Hoodia, which has been proven time and again to be ineffective, as well as an extreme amount of calcium, which when taken in excess may adversely affect the body's ability to absorb this vital nutrient. On the bright side, Slendatrim is fairly inexpensive and costs about 40 dollars for a month's supply. But given the risks (Hoodia has also been linked to plenty of side effects such as nausea, vomiting, and skin irritation too), it seems this product has more negatives than positives. Although Slendatrim offers plenty of bright and shiny advertising, do not be fooled by any of it. Given our analysis of its ingredients and customer support system, this is simply another mediocre product with plenty of false advertising behind it. Although Slendatrim may work in a marginal sense, the results will hardly be what the product's website may lead you to believe. Phrases like "mind blowing results" are hardly the case for Slendatrim, and rather the customer is more likely to lose a small amount of weight over a long period of time. Moreover, this product clearly hasn't allotted the proper time to research its own ingredients seeing as they've used far too much calcium, which may lead to absorption problems for the consumer down the line. In conclusion, it is strange Slendatrim claims to be most effective supplement. In fact, this statement is only half correct: given Slendatrim's reckless use of ingredients and sloppy customer service, Slendatrim truly is not for someone looking to lose extra weight. However, it's also not for someone looking to lose a lot of weight either as it is ineffective and just another example of limited effectiveness hidden behind good marketing.